Republican Presidential candidate Donald Trump has made a number of comments about the Bible in the past few days, from suggesting that Secretary of State John Kerry hasn't read it, to claiming that no one reads it more than himself. 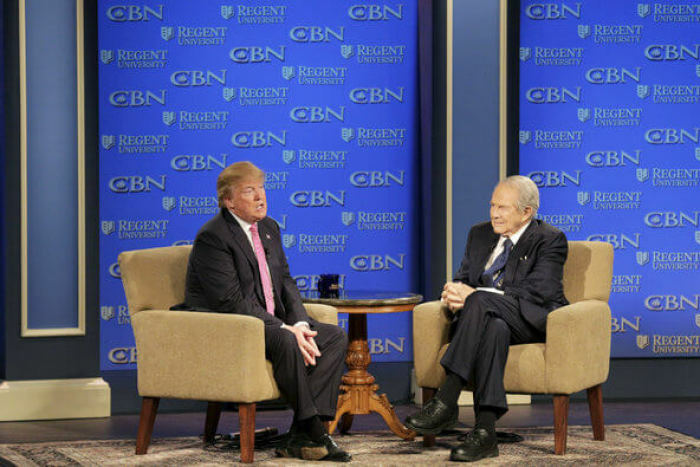 Trump told CBN's Pat Robertson at Regent University on Wednesday that the United States has made a number of foreign policy mistakes during the past couple of decades, including the recent nuclear deal with Iran which lifted economic sanctions from the Islamic Republic in exchange for limiting its nuclear program. "When you think of how Iran is doing lately, right? Between the Iran deal, we give them $150 billion — we got nothing for it," Trump said. "We should have gotten our prisoners back long before we started negotiating ... (Secretary John) Kerry — this is the worst negotiator I think I've ever seen." "Obviously Kerry did not read The Art of the Deal. Probably didn't read the Bible, either." Kerry is a devout Catholic. He spoke about his faith in a Dec., 2013, interview with ABC News, and described how reading the Bible helped him understand that suffering is part of God's plan. "You read the letters of St. Paul and you read other parts of the scripture and it talks about suffering and it talks about adversity. And I sort of began to put that in a better place. Not see it so much as, you know, a determinative God who makes every decision for everything that happens. But rather creates a framework within which we're responsible for making things happen," Kerry said at the time. "Nobody reads the Bible more than me," Trump declared ahead of his third consecutive win in the GOP primary in the Nevada caucuses. Trump has insisted that he is a committed Christian despite making some gaffes related to the Bible. He described "Second Corinthians" as "Two Corinthians" at Liberty University earlier this year after the verse was provided to him by Family Research Council's Tony Perkins. Perkins said that he can accept the blame for Trump's gaffe at the time, since he wrote some helpful notes which referenced "2 Corinthians 3:17," but said that Trump's mistake "shows that he's not familiar with Bible." Trump called the Bible his favorite book back in August 2015, but then refused to name his favorite verse when asked repeatedly in an interview on Bloomberg's "With All Due Respect." "I wouldn't want to get into it. Because to me, that's very personal," Trump explained at the time. "The Bible means a lot to me, but I don't want to get into specifics." Then later he claimed his favorite verse is "never bend to envy," which is not in the Bible. Trump says he is a Presbyterian and a member of Marble Collegiate Church, but Marble Collegiate is not a Presbyterian church and has no record of Trump being a member. The GOP frontrunner has also insisted that he has a "great relationship" with God and with evangelical voters. "I live a very different life than probably a lot of people would think," Trump has said. "I'm talking about over the last number of years, I'm leading a very good life. I try to lead a good life and I have." Before the Iowa Caucus, he attended a church service in Iowa as part of his outreach to Evangelicals. But the church he attended was a Mainline Protestant denomination that supports gay marriage. At another Iowa church service, he put money in the communion plate, mistaking it for the offering plate. Some conservatives, such as TV personality and radio host Glenn Beck, have dismissed the entire notion that Trump even reads the Bible. Beck, who is a Mormon, said at a Ted Cruz rally earlier in February that "too many people are looking at Trump and believing that man has ever opened a Bible … that's the biggest crock of [expletive] I've ever heard." "I'm going to be very blunt with you tonight," Beck added. "Donald Trump is very dangerous in my opinion."